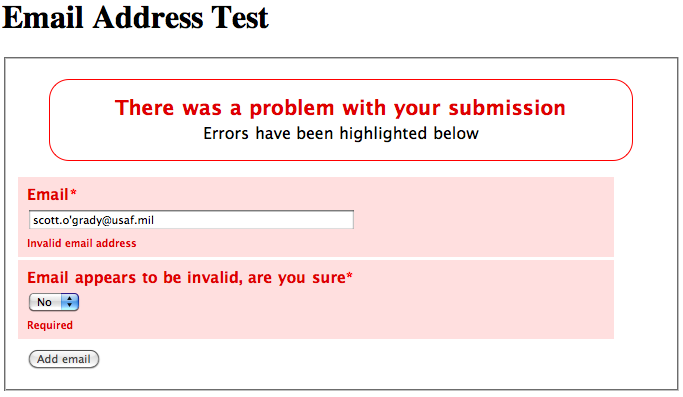 I ran into an issue with a library that did email validation. One of the client’s email addresses didn’t validate and while debugging the code, I realized that more than just that client’s email address could be rejected. While using a regexp is not a failsafe solution to email address validation, it does attempt to make sure you are getting a reasonably good email address. However, the regexp can still fail and in some cases, you get a client that is turned away. The only true way to validate an email address is valid at least once is to require a client to receive an email and validate their account. With so many throwaway account services, you can never be assured that anything past that first email address will ever be received. However, to give you the best chance at getting a valid email address, you need to do some validation. There are a number of methods for validating email addresses on the internet and most fail somewhere. Do you accept emails with ” or < > in them? You might, since some email clients paste that information when you copy an email address. Or, do you accept the bare minimum email address, accepting the fact that people could use -, +, . or even ‘ in the name portion? Trying to get the person to enter a name that is reasonably valid is the goal. One could have a very generic rule that looks for an @ with a . after it and some characters. That would ensure almost the largest cross-section of potential email addresses but we may have cast too wide a net. We could go with a very strict regexp but potentially miss out on some corner cases. Our regexp fails to recognize the email address even though it is valid. Of course, this requires someone to adjust some code and we’re fine until the next email address that fails our test is entered. What if we introduce a new error condition, a soft fail. If the address passes our very simple test and looks to have a valid email address construction, we’ll put another field asking the user to check to see if any typos were made. Users that pass our more stringent regexp wouldn’t be subjected to the soft fail error handling. When a user is subjected to the soft fail, our software can log the email address so we can adjust our validation rules, but, we’re not restricting a client from being able to sign up because their email address didn’t fit the regexp that we’re using. While I feel reasonably confident with some of the regexp’s I use, email validation has always been one of the most troublesome portions of any system we’ve designed. For the above test, we used Deform/Colander and Pyramid. On Nov 4/Nov 5 a rumor that was later substantiated regarding Pylons surfaced. While the initial message was regarding TurboGears which is based on Pylons, the rumor was that Pylons was being rolled into another framework. Ben Bangert issued a post that gave some of the reasoning behind the merger of repoze.bfg and Pylons. Since we’ve been working on an application for the last few weeks that isn’t in production, it seemed like an ideal test case. While the documentation for Pyramid is superb, transitioning from Pylons to Pyramid still has a few rough edges as the terminology that Pylons developers are used to were changed. The decorator signifies the template that you want to use and variables that you want to pass to the template are returned. This ends most of the tmpl_context. or c. clutter that was present in controllers and templates. More documentation on handlers is available here. An early version of the pyramid templates does not contain the weberror helper that was available in Pylons. The Pylons paster templates that are included in Pyramid do have the helper. A discussion with Chris McDonough should result in the changes being made to the Pyramid templates as well. Another area that needs attention is Flash messages. Currently they are not supported and webhelpers.flash appears to implement things in a manner that won’t work with Pyramid. Through the subscribers method in Pyramid, it looks to be somewhat trivial to implement. The existing Pylons template in Pyramid does contain passthroughs of the c./tmpl_context. globals and helper modules that were available in Pylons. Modifying that slightly should allow Flash messages to be easily enabled. If you are going to transition, it would make more sense to use one of the Pylons templates than to migrate straight to the Pyramid templates. mentions the existing global handling of the special objects for which Flash messages can probably be reimplemented. SQLAlchemy is supported, but, there is an additional extension loaded which appears to do an autocommit on SQL queries. A brief readthrough mentions that you need to use s.join() to join your two database queries to be handled. It appears that you can join two db handles on separate databases which makes this a bit more powerful than using normal transactions as you could ensure a record was written to mongoDB and MySQL. I need to spend a little more time reading through this. pagination appears to depend on routes, and even with routes installed, an error is thrown with thread._local requiring a mapper which is probably not going to work with Pyramid and will require some rewriting. This appears to be the same issue (thread._local) with Flash messages and it was mentioned that both items were relatively high priority and easy fixes. There is a minor problem with validation with FormEncode that we’re still working with dealing with validation on a form that has been bound. webhelpers – Most webhelpers appear to work fine. It was refreshing to see that many of the webhelpers.constants work fine without having to swap the order of the tuples with Deform/Formish. Currently, Flash and Paginate are broken as mentioned above, but, those will be fixed relatively quickly. I’ve not gotten the 401/403 error to prompt for a login, but, I believe that is something minor that I’m missing. In addition, I need to modify the schema to use an SQL backend. All in all, transitioning the code took a bit longer than anticipated and I received some great advice and help from Ben Bangert and Chris McDonough on IRC. I tried to keep my questions to a minimum, but, transitioning from Pylons to Pyramid is going to be harder than moving from repoze.bfg to Pyramid. Overall, I feel pretty good about the move. I had been a TurboGears users since 2.0-beta and moved over to Pylons for most development a few years back. After having spent 16-20 hours working with Pyramid, I believe that Pyramid is a step in the right direction. In addition to moving this app from Pylons to Pyramid, we switched from Mako to Jinja which required some rewrites of the templates. Mako is still used for FormAlchemy and is loaded in our Pyramid installation. I don’t really see anything that would make me consider using another framework and I think it is a step in the right direction. Quick apachebench tests show some performance improvements which is also a nice benefit. While the software has an Alpha designation, from a stability standpoint, I’d say it performs more like a Release Candidate but the Alpha designation is probably maintained so that API changes can be pushed as necessary. To the entire Pylons and Repoze.bfg teams, I say Congratulations! I see some great possibilities on the horizon with a larger community behind Pyramid. After working through quite a bit of the documentation on the pylons site and the repoze site, I didn’t really find a step by step guide to get repoze.who/repoze.what working with Pylons. Thanks to my nephew Qwait for overloading ActionProtector to intercept 403s and give an additional chance to authenticate. Because of the association table and the cascade, you must use MySQL or Postgresql rather than SQLite. You also might need to modify development.ini [server:main] host/port.